Discussion in 'Disney Pin Discussion' started by Pinopolis Ambassador, Jun 3, 2018. Happy Sunday evening to everyone. Quick update, we Are currently finishing up all of the International orders for the golden magic series # 1. We will start shipping the domestic orders as soon as possible. keep looking for those tracking numbers. I was not aware of this forum until this evening! I will make sure I post updates here daily! Hope you have an amazing week!!! Your friendly neighborhood moderator here. Please post any inquiries about Pinopolis Pin Game pins here. The OP's user name will change soon to reflect that she is associated with Pinopolis. It would be nice to try to have all inquiries about Pinopolis pins in one thread, rather than the multiple ones we have going. Awesome! Glad to have a Pinopolis rep here to help us! Here is what I've posted elsewhere regarding the lanyard trading at the upcoming events. Thanks in advance for guidance! 1. Although pictures of the lanyards shown so far show lots of the pins on the lanyard, the narrative said that there will be 5 of these pins per lanyard. I am thinking they will have more than 5 total pins on a lanyard, So will they have multiples of each pin on the lanyard to fill it up? 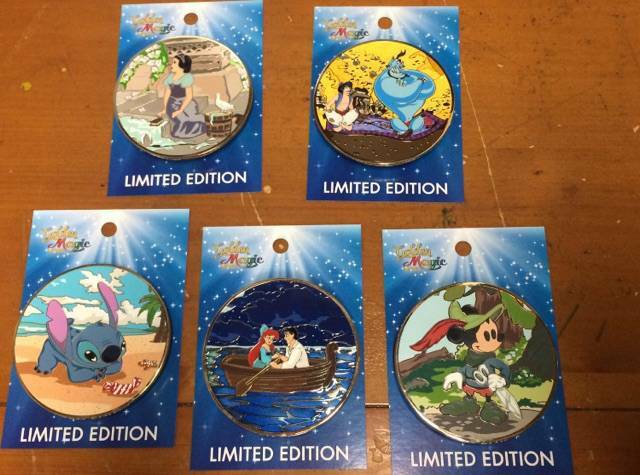 Or will they also have a mix of non-LE pins and you have to pick the right ones? Or should I ignore the narrative and the picture is how they will really be (with about 11 LE pins per lanyard)? 2. They also seem to indicate that each of the five colored lanyards will have different pins, at least in their words. Which makes sense since they were showing a total of 35 "reveal" pins to start with. But again, the photo of the lanyards they have in their announcement shows the exact same pins on all colors of lanyards. So same pins on every lanyard (and if so, why the different colors?) or different pins on each lanyard? 3. They also indicate you can trade for a total of 10 pins - 2 pins per lanyard, 5 colors of lanyards. But how will they control that? It's a free event so even if they are giving out color-coded tickets at the door, what stops someone from using their tickets, leaving, and coming back in a few minutes later to get another set of tickets? They going to be checking IDs and tracking names, etc? Or are they only going to have one person with each colored lanyard and just expect that person to recognize faces and make sure nobody goes back for seconds? Or is there really not any limit? I have read your post. Great questions. The lanyard trading is a whole new program for us. We will have these 35 pins at the Vegas event. We will put 5 different pins on all of the lanyards. Once those 5 designs are all traded (from all lanyards) we will FLIP to 5 new designs. Kind of like DSF. Some pins will not trade as fast as others. But we will not flip until all 5 of the designs are gone. The event staff will have the names of the traders at the front tables were we will hand out the tickets. Once your tickets are gone, you are done trading. I was told by a rep at the event Sat. golden magic #1 pins are delayed because you are waiting on the backer cards will you receive the backer cards soon so you can fill orders? Not sure who you talked to buy we do have the card backs and we are contunuing to ship all this week! So when we arrive at the event, even if we are doing free entry at noon, we check in and get trading tickets? Thanks! This was hugely helpful for me and I think I now understand how it will all work. I look forward to participating in Orlando. And for all you Vegas goers, sounds like a desire/need to trade is a very likely thing! Once Pinopolis has the pins in hand and full all preorders, will the company sell any extras online? If we have any left they will go on our website. So, I ordered some pins from the Princess Profiles and the golden magic series. Will these be shipped sperately or all together? These are amazing looking pins. I cannot wait to see them in person. Very excited for them to finally ship. As a FYI, I will be closing other threads asking questions about ACME/HotArt/Pinopolis pins within the next few days. Please put all your questions in this thread! I'll tag others as I see them post in other threads as well. I believe my questions (for now) have been answered. It is nice for someone to be providing information. Hopefully it continues. Thank you. Or anything else you want to chat about. Pinpics question - I’ve been trying to add pins but the captcha is down so can’t submit. But I see new pins showing up so others are able to. Is it that it is sometimes up sometimes down? Or need to use a specific browser (I’ve tried several)? Other? We are currently in the process of trying to fix this. The person that had developed the website is no longer with us so we do not have the code that was used. We have a nother Web developer that is looking through the code but it is taking a lot of time. Let me Do some research and find out who has been able to post and how there's been able to do it. Nice to have someone to contact here, thanks @Pinopolis Ambassador . I have a question regarding the Wonder Woman pins, do you have any updates on those? I am contacting the owners right now to find out what is going on with the DC pins. As you may know we have already shipped out all of the LE 50 pins that we received. I am updating everyone this evening as far as other shipping schedules. Thank you for your response, were the LE 50 pins shipped recently? I ordered 1 and haven't received it yet. Can you email or PM me your email address and I will check for you! Shouldn't the PinPics ambassador be the one answering questions about PinPics and gold memberships? I am the "ambassador" for all 4 companies that are all owned by one person. That is who I work for.